Hanover, Germany/Bangkok, Thailand, November 21, 2017. The leading technology company Continental celebrated today on November 21st the Foundation Stone Laying Ceremony, marking the start of construction of its new Greenfield tire plant in Rayong, Thailand. The ceremony was attended by Mr. Chalee Chotiwong, Chief of Provincial Administration Organization for Maenamkoo district, as well as Continental management, the local project team, and suppliers. 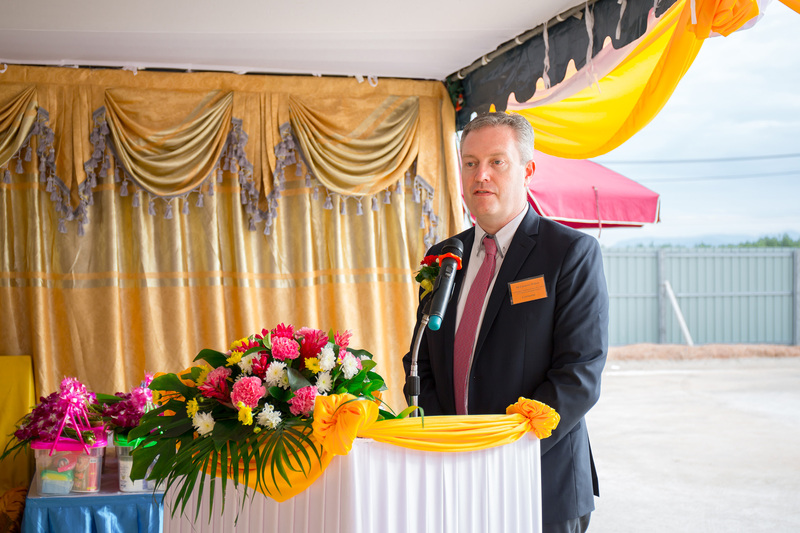 Cameron Wilson, Vice President Marketing & Sales Passenger and Light Truck Tires ASEAN kicked off the formalities, highlighting the Rayong plant’s importance as part of Continental’s overall Tire Division strategy. “This investment is an essential part of the long-term growth strategy - ‘Vision 2025’ - aiming to expand and balance our global manufacturing footprint to best serve customers worldwide. One important pillar of our long-term strategy is to operate with an agile and flexible set-up that enables us to react quickly to the market requirements, establish further production capacities in the growth region Asia with high-tech production capabilities – and Rayong perfectly serves this purpose”, emphasized Wilson. “The combination of innovative German engineering coupled with local Thai production capabilities will ensure the manufacturing of high quality tires which Thai and Asian consumers are looking for, thus fulfilling our philosophy of ‘in the market, for the market’. Consequently, we are continuing to increase our investment in this market by expanding not only our sales and marketing operations in Bangkok but also the number of Continental branded retail shops.” Ultimately, he highlighted that the ‘Tire business is also a people business’: ”Continental plans to be a top employer in the region of Rayong. Our successful progress is based on our people, therefore I would like to thank the entire team for their contribution and commitment”. Since the appointment of the general contractor, Thai Takenaka International Ltd. in mid-September 2017, the Rayong site, located in eastern Thailand, has developed significantly. Temporary site offices and the worker´s village are currently being erected, the pile cutting and the foundation works are in full swing. At the moment, around 450 workers are on-site, and that number is expected to increase to more than 1.600 in the next three months. “We are well on track with our Greenfield project and today is an important milestone for us. We plan to finalize our hot preparation and mixing areas by end of March 2018. Final completion of construction works will be in the end of 2018. Besides the ongoing civil works, this year we already initiated the hiring process for key positions in the local team. By today, our local team has expanded to around 25 employees. We will initiate the extensive hiring period in early 2018 to focus on new employees for our production facilities. With focus on highest quality and efficiency standards, we will train our new employees in our other Continental tire plants, to benefit from the existing knowledge of our sister plants,” stated Vignesh Devasenapathy, Project Leader. The speeches from Cameron Wilson and Vignesh Devasenapathy were followed by a traditional Thai stone laying ceremony. Respecting the local culture, the Buddhist monks and Brahman started praying and accompanied the chairman of the ceremony to mark the foundation stone. Following, the chairman knocked sticks in the stone pit and spread flowers. According to the German culture, the Buddhists monks included the ritual of burying a time capsule, filled with a local newsletter of the day as well as a Continental magazine, to bring luck to the future business of Continental. 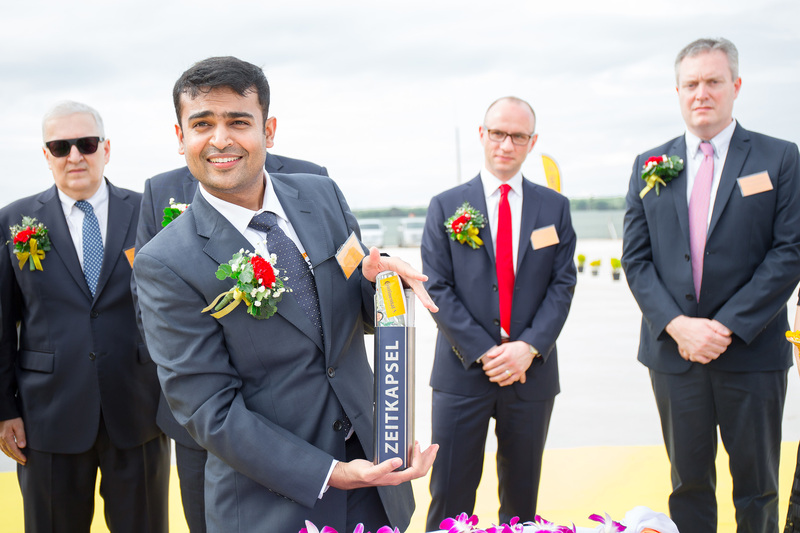 Continental has committed to a long term investment totaling in the first phase to around € 250 million (approximately THB 9.75 billion) with a planned production of about 4.0 million passenger and light truck tires (PLT) per year by 2022. The start of operations is planned for 2019 and Continental will create around 900 new jobs in Thailand. The new Greenfield tire plant in the province of Rayong is the fifth Greenfield that is ramped up since 1999, and expands the global tire production footprint of Continental’s Tire Division to 21 tire plants in 17 countries. The size of the site is about 750,000 m² which potentially allows an expansion to up to 25 million tires capacity per year. The plant will be fitted with state-of-the-art technology, and will be Continental Tire’s most environmentally friendly plant.